Students in the Early Childhood Education campus are working on an exhibit whose artwork will be on sale for parents the week of April 16, 2018. The theme of the spring art exhibit is "Fly a Kite/Sail a Boat/Smell the Flowers" and is under the direction of Ms. Clara Dobbins, an artist and a volunteer grandparent. 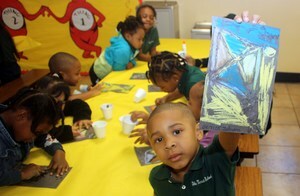 The cost of the artwork is $3 each and instructions will be available. 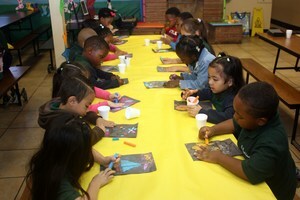 Parents may purchase their child's or any art exhibit painted by the Early Childhood students. The art will be sold on a first-come, first-serve basis. Thank you, parents, for making The Varnett Public School your school of choice.